In January 2007 Swedish Pro Mod racer Freddy Fagerström announced that he had bought Urs Erbacher's multiple FIA Championship-winning and European record-holding Top Methanol Funny Car and intended to contest the 2007 FIA European Championship tour. Photo-journalist Stefan Boman spoke to Freddy on Eurodragster.com's behalf to find out what made him change classes, whether this meant the end for his wild 6.2-second blown-alcohol pick-up, his thoughts on his European Championship chances, and more. Click on any picture (including the above) for a large version. Eurodragster.com: Congratulations on your new ride. How did it come about? Freddy Fagerström: I had the feeling that my racing had come to a dead end where I had reached the peak performance of the Pro Mod pick-up. I found myself in the middle of the field with no possibility to improve. The only way I could win a race was from somebody else's mistake and this is not how I wish to compete. Eurodragster.com: Why do you feel you had hit the performance peak of the pick-up? Freddy Fagerström: I don't think Chevrolet spent too much effort wind tunnel testing the 1966 pick-up when they built the car (smile). When I hit 220 mph the air resistance is like a wall and the tyres start to spin. More engine power would just spin the tyres more and not improve speed. Over the years we have made every possible aerodynamic change without destroying the identity of the car. The next step would be such dramatic changes to the design that it would no longer be a 1966 pick-up. The whole idea about "shoebox" racing is racing a shoebox, not a Funny Car with doors. Eurodragster.com: So then you might as well drive a Funny Car? Freddy Fagerström: I borrowed a car from Magnus Larsson during 2003 and liked the class. I could have stayed in Top Methanol Funny Car then, but at that time my two sons forced me to switch back to Pro Mod. They liked the pick-up more and declared that they would cut the Funny Car chassis in half when I was asleep if I did not do as they said. Now they have grown older and do not care what their old man does. Eurodragster.com: Has the return to Top Methanol FC been in your mind all the time but just awaiting family approval? Freddy Fagerström: Oh no, I never plan that many years ahead. It was a series of circumstances in where one thing led to another. It was actually Martin Lundqvist who suggested that I go Top Methanol FC and offered me his own car. With a poor chance of winning in Pro Mod I was open-minded and thought that it was a good idea. I talked to Jörgen Leanders to get some Top Methanol FC advice before making up my mind, and he asked me why I didn't buy Urs Erbacher's car then. I got Urs' phone number and called him, the rest is history. Eurodragster.com: Was it hard to give up Pro Mod? Freddy Fagerström: I removed the words "give up" from my language a long time ago. But if you are asking if I will return to Pro Mod, I don't exclude anything. Just as a series of circumstances put me in Top Methanol FC, they could send me back to Pro Mod. Eurodragster.com: Is racing two cars, as you did in 2003, an option? 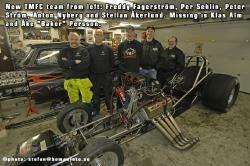 Freddy Fagerström: In 2003 I was more into testing Top Methanol FC while racing Pro Mod as I got the offer to borrow a car. This year I will be racing to win and wish to focus on this. I might bring the pick-up to run in exhibition at some events if it doesn't interfere with the Top Methanol FC. Eurodragster.com: How do you view your chances of winning the Championship? Freddy Fagerström: It's no picnic but just as Håkan Nilsson proved in Top Fuel, you can win in your first season in a new class. I already called Ulf Leanders and asked him to get a tailor to adjust the length of his smoking jacket so I can borrow it for the FIA ceremony in Monaco. I don't have a suit myself and thought he won't need it. I was originally thinking of calling Leif Andréasson about this but I guess his is too narrow over the shoulders (smile). Eurodragster.com: Besides your bigger chance of winning, are there any differences in racing between the two classes? Freddy Fagerström: There are more cars in Pro Mod so qualifying is tougher, but both classes provide good racing. One thing I like more with Top Methanol FC is that you cannot run with the two-step starting system to control start line RPM as in Pro Mod. I find it more fair when you can actually drive away from your competitor, not just out-perform them. 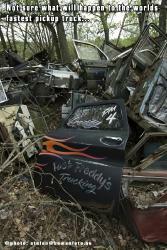 This is also one reason why I think my chances of winning in Pro Mod are poor. Before the two-step I could try to outrun them by being a better driver, but not any more. Eurodragster.com: Many fans know you for your flamed paintjobs and long burnouts. Will we see these in Top Methanol FC? Freddy Fagerström: What made my long burnouts possible in the pick-up was its ability to reverse at high speed so the total time of the burnout was still acceptable. Unfortunately I don't think this is possible with the Funny Car. I'm not saying I will do short burnouts, but shorter. When it comes to paint I don't really understand the question. Are you saying there is another way of painting my race car than with flames? Eurodragster.com: Of course not, stupid of us to ask. If the paint is as usual, will the team be the same as well? Freddy Fagerström: Some guys remain, some have stepped aside and a few new faces have shown up. Among the new crew are some with Top Methanol FC experience as well as a computer analyst. I have been racing without a computer in Pro Mod but as one comes with the new car I might as well have somebody who understands it. I myself am on the level of just about understanding Tetris. Freddy Fagerström: I hope my old sponsors will remain but there is always room for more! Eurodragster.com: Thank you for the chat and good luck in the Top Methanol FC! Freddy Fagerström: Thank you for showing an interest. 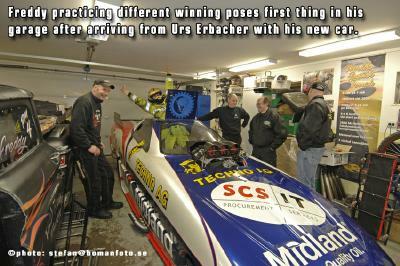 Feature ©Stefan Boman and Eurodragster.com.